Mulligan's Pointe ( Formerly Sussex Pines Country Club's) 6,659 yard, par 72 layout was designed by world renowned architect, Edmund B. Ault, ASGCA. This very walkable course features four sets of tees to provide an enjoyable experience for golfers at every level. Originally named for the towering pine and hardwood trees which line many of the holes, the course challenges the golfer while providing a relaxing environment and picturesque setting. Mulligan's Pointe offers all the amenities of a private club, including a full scale driving range, practice green, and a chipping/bunker practice area at a Public Course price. Southern Delaware's moderate climate provides opportunities to play golf year round. Milder days coax players to the course during the winter months. The full service Pro Shop, under the direction of PGA Head Pro, John Wallett, provides PGA Certified instruction, cart rentals, club and cart storage, club cleaning and repair, and a full line of men's and women's equipment and golfing apparel. Tee times are always recommended. Mulligan's Pointe supports an active golfing program that provides friendly, supportive opportunities for play at all levels of expertise from beginner to scratch golfers. Guests may walk or ride in carts while playing the course. In addition to regular play, the club sponsors numerous tournaments for the benefit of members as well as guests and community groups. Ladies' Host a Nine Hole and Eighteen Hole Associations as well as an evening Men's League featuring nine holes of golf and dinner are held from April to October. All golfers are welcome to join men's or ladies league. Details at Pro Shop. 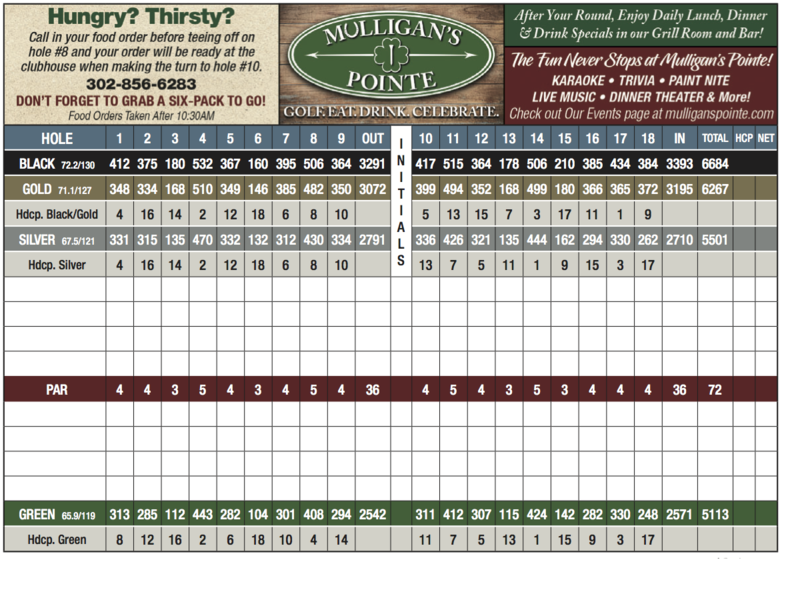 Mulligans Pointe is a member of the Maryland Interclub Seniors Golf Association (MISGA) which provides men aged 50 and older with the opportunity to play and compete on other area courses at affordable rates. The club sponsors and administers an active junior golf program that teaches youngsters the fundamentals and rules of the game. Mulligan's Pointe offers a special Junior Golf Membership for youth from non-golfing families.